Cast: Matsumoto Jun, Kagawa Teruyuki, Eikura Nana and Kishibe Ittoku. In Japan the conviction rate is 99,9% which means when someone is prosecuted the chance for being exonerated is only 0,1%, so if you are innocent your chances are very low. This drama follows a special team of lawyers and paralegals challenge the system by taking on the cases of 0,1% to find the truth. 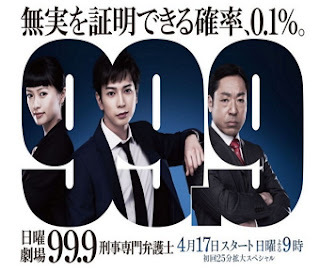 Miyamoto Hiroto (Matsumoto Jun) is a lawyer who lives for finding the truths behind cases that includes investigating himself. Though he has zero interest in money, he has a high sense of honesty. Another Arashi drama! I simply love their dramas since they are probably some of the best Japanese idol actors out there, good enough to lose the 'idol' and just be seen as actors. Matsumoto has had a couple of good ones, and to be honest I was afraid he'd do a romance again (not that he's bad at it, just way too typical), so you can imagine my surprise when I saw him in a drama with no romance. It is also one of the few where the focus is mainly on the sub-stories of the drama, and doesn't really have a main storyline that fills the plot. This makes it easy to follow even if it is quite heavy with the law and legal talk going around. Besides that, the general drama is not really one of my favorite. It is interesting, but not something you watch to follow every single week, and it doesn't keep you on edge – not that it is necessary for it – but it makes it pretty slow paced while watching. All in an okay drama to watch, but not a drama that keeps you on edge.